On "D-Day" in June 1944, Allied forces disembarked on the Normandy beaches, in a massive surprise attack that was to mark the beginning of the end of the Second World War. Thousands of Allied troops – Americans, British, French, Canadians and others, gave their lives in the battles to recapture Normandy and achieve victory over the Nazis. The Normandy beaches and the area inland are today the site of many memorials and museums in memory of those who fought through and those who died during this momentous period of history. For more on the Normandy landings area, and a map, see Bayeux. 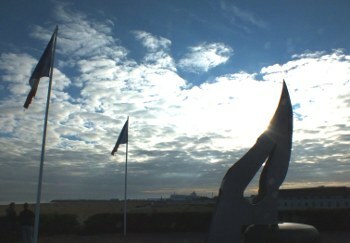 Photo above : memorial on Sword Beach, Ouistreham, near Caen. Normandy is one of the great historic regions of France. In the Middle Ages, Normandy was one of the great dukedoms which, like Burgundy, rivalled in power and prestige with the kingdom of France. Indeed, the dukes of Normandy managed to achieve the same status as the kings of France, to whom they owed alliegance. Before he died, the king of England, Edward the Confessor, named his nephew William, duke of Normandy, as his successor. But after Harold, William's cousin, took the English crown for himself, William invaded England in 1066, to assert his claim to a royal crown. The story of Harold and William the Conqueror is magnificently told in the historic Bayeux Tapestry, which can be visited in Bayeux, a few miles to the west of Caen. With their historic links and their proximity, it is hardly surprising that the Normandy area has much in common with the south of England; the rolling countryside is not too different - fields and meadows bordered by hedges, even bluebell woods. Furthermore, the historic and vernacular styles of architecture are not too different either. 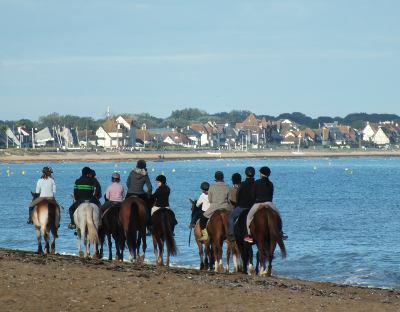 Normandy is famous for its beaches and its horse riding. Recently reunited as a single region, the area that was once the dukedom of Normandy was until 2015 divided into two administrative regions - Upper Normandy (Haute Normandie), capital Rouen, with its two departments, Eure (27) and Seine Maritime (76), and Lower Normandy, (Basse Normandie) capital Caen, comprising the departments of Calvados (14), Manche (50), and Orne(61). Since 2016, the region of Normandy has been once again reunited, to the satisfaction of many Normans. 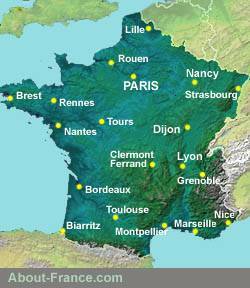 To the south east, the Normandy area borders on the Ile de France, the Paris region, and towns and villages in this area have developed due to their proximity to the capital. Both Caen and Rouen are sufficiently close to Paris to benefit from the economic vigour of the Paris region, which is the most propserous in France, and from their position between two major hubs of international communications - Paris for air travel (parts of south east Normandy are less than 100 km from Charles de Gaulle airport), and the Normandy port of Le Havre, France's most important international shipping port. Le Havre, Caen and Rouen are the three main cities in this region. For details of these cities, see below under Tourist attractions. There are four smaller cities - or large towns, these being Evreux, in the Eure, Cherbourg - still an active seaport, though less than in its heyday when it was France's gateway to America - Dieppe, a minor seaport, and Alençon, capital of the Orne. Two particularly interesting small towns in Normandy are Bayeux and Honfleur . Outside the towns and cities, Normandy is a prosperous agricultural area, specialising in dairy products, fruit (notably apples) and mixed farming. The most famous regional products are the cheese Camembert, and two drinks, Cider and the spirit distilled from it, Calvados. Normandy is also famous for its racehorses, and the region has many top breeding stables. Direct access by ferry from the UK, to Cherbourg, Caen (Ouistreham), Le Havre or Dieppe. Giverny: (near Vernon, 27) Visit the home of the greatest Impressionist, Claude Monet, and the Giverny Museum of Impressionism - formerly the Museum of American art. There are more works by the major Impressionists in the museums at Rouen and Le Havre (see below). The Normandy Beaches (14) - the site of the D-Day Landings in World War 2 - Omaha Beach, Juno Beach, Utah Beach and the others. The landings are commemorated in monuments, museums and the war graves of the thousands who gave their lives. Normandy beach Coach tours depart from Bayeux. Bayeux (14), attractive old Norman town where the historic Bayeux tapestry was made, and is still preserved, 900 years after it was made. The museum is open 7/7. Departure point of coach tours of the Normandy beaches. Falaise (14) - impressive Medieval fortress, birthplace of William the Conqueror. The Lower Normandy seaside (14) Between the Seine and Caen, the coast of lower Normandy offers a succession of genteel seaside resorts, including Trouville, Houlgate and Cabourg, etc. - resorts that flourished in the ninetenth century, as the closest to Paris. Honfleur (14) Attractive small port at the mouth of the Seine. Old harbour with picturesque quayside; Eugène Boudin museum. St Catherine's church, from the 15th century, is the largest historic wooden church in France. Rouen (76), with its quays on the river Seine, its picturesque historic centre, with half-timbered houses, an ancient clock, and a magnificent gothic cathedral, one of the finest in France. The Rouen Fine Arts museum - musée des beaux arts - has the best collection of works by the Impressionists outside Paris, plus a broad collection of old masters from 15th century to the 20th century, including Rubens, Velasquez, Poussin and many more. There is also the Joan of Arc museum . Le Havre (76) -In the 1950's, the old town, destroyed in the war, was rebuilt in concrete by architect Auguste Perret, to the wishes of the Communist city council. This example of postwar urban planning is classed as a UNESCO world heritage site. The White Cliffs of Etretat (76) - the most famous cliffs in France. Pays d'Auge (14, 61) - the archetypal Norman countryside, with its small villages and traditional half-timbered cottages. La Suisse Normande (14, 61) - the highest hills in Normandy, around 1000 ft., loved by hikers and ramblers - though they are a long way from being mountains. Le Mont Saint Michel, (50) the world famous medieval abbey built on a rock in the bay - a UNESCO world heritage site. One of France's most visited historic monuments. Le Cotentin: (50) countryside, cliffs and sandy beaches, on this granite promontory jutting out into the English Channel. The Cotentin coastline, from Juno beach up to Cherbourg, and then down again to Mont Saint Michel, has numerous attractive beaches and small seaside towns, many of them free from crowds even in high summer. Le Cité de la Mer, Cherbourg: (50) Devoted to underwater exploration, the museum includes a visit of the Redoutable, the biggest visitable sub in the world, plus the deepest aquarium in Europe. 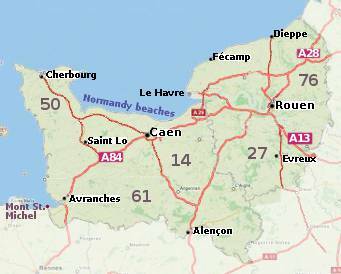 A small hand-picked selection of hotels in Normandy. Click hotel name for booking options and best rates. About-France.com takes the strain out of finding a good hotel. Before listing any hotel, we read customer reviews to make sure that it meets our standards or selection criteria. For our regional lists, the main criterion used is visitor satisfaction. We only list hotels which are generally recommended by people who have stayed in them. As a result, our hotel lists are short and very selective. Naturally, the type and quality of service provided will vary according to the hotel; visitors cannot expect the same service or room quality in a two-star hotel as in a four-star chateau hotel. Our choice lists hotels that are generally judged to be above average or well above average for their category. The Normandy area, the former dukedom of Normandy has recently been reunited into a single region; Until 2015, it was split into Upper Normandy (Haute Normandie) in the east, and Lower Normandy (Basse Normandie) in the west. This guide covers both regions. A small part of the 11th century Bayeux Tapestry, celebrating William the Conqueror. Just a short ferry ride from the UK, Normandy is a beautiful part of France with fine beaches, bucolic couyntryside, and a world famous cultural and historic heritage. Beyond Paris, a guide to the French regions and their tourist attractions. Make the most of your trip to Paris; Information on attractions, Paris hotels, transport, and lots more. Information on things to do before starting your trip to France. Cities, towns, departments, regions, climate, wine areas and other themes. A mine of information about life and living in France, including working in France, living in France, food and eating, education, shopping. Encyclopedic dictionary of modern France - key figures, institutions, acronyms, culture, icons, etc.